3: How did Illinois get to this point? As Gov. J.B. Pritzker and the 101st General Assembly settle into office, they face a daunting task: governing a state with severe fiscal problems, continuing population loss and comparatively lackluster economic growth. To meet this challenge, the governor and the General Assembly must confront the reasons behind the state of affairs in Illinois, embrace the solutions that will put the state on a better path, and reject proposals that would double down on the bad policies that have driven Illinois to this point. 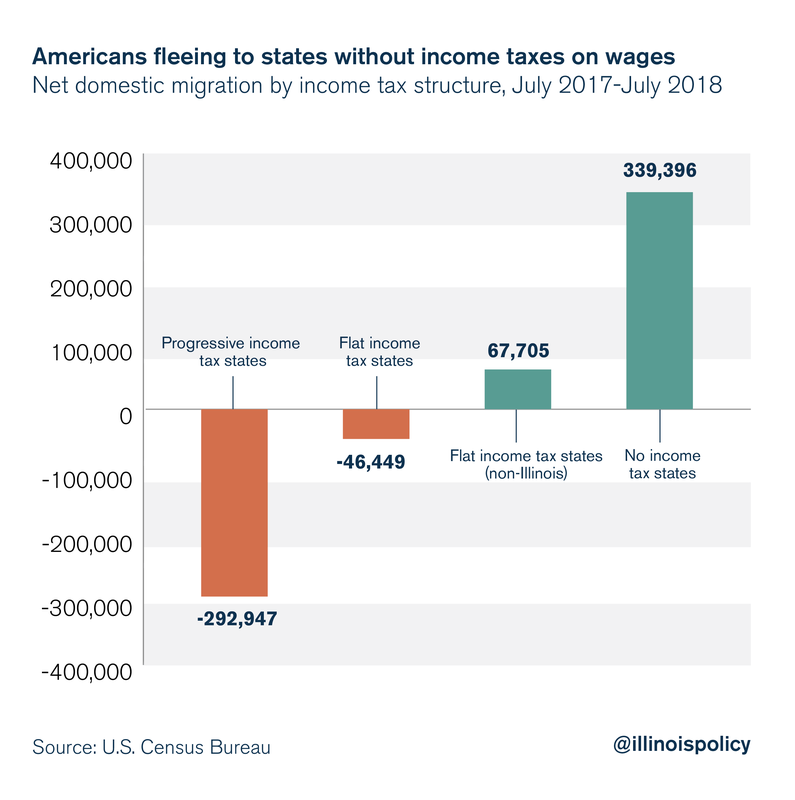 Reversing the state’s outmigration of residents and encouraging the job creation Illinoisans need to thrive – and the state needs for stable revenues – require lawmakers to rein in government overspending and resist calls for tax hikes that would further depress Illinois’ economic growth. Illinois was once one of the most prominent contributors to the U.S. economy. In fact, Illinois commanded the third largest share of the national economy in 1966 and was responsible for 6.6 percent of total U.S. GDP. But the state has gradually become a less important player on the national economic stage. By 2017, Illinois was the fifth largest contributor to U.S. GDP – responsible for 4.3 percent of the national economy – having been passed by Texas and Florida. On its current course, Illinois will likely continue to lose influence as these states and many others experience faster economic growth. Illinois can embrace pro-growth policies to rev its economic engine and foster the job creation residents need to plant roots and thrive in the state. Long-run economic growth can be decomposed into three factors: population growth, employment growth and labor productivity growth. In order for an economy to grow, one of these three factors must increase. By contrast, for Illinois to underperform the rest of the nation, at least one of these measures must lag the national average. One of the largest factors acting as a drag on the Illinois economy is the state’s people problem. 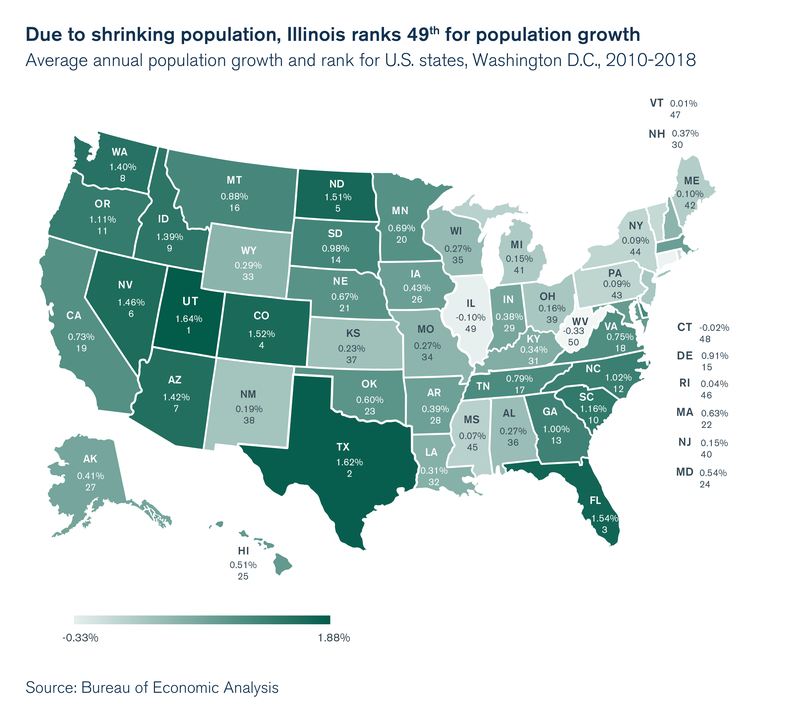 Since 2010, average annual population growth in Illinois is second worst in the nation behind only West Virginia, according to data from the Bureau of Economic Analysis. Illinois comes in 49th in terms of population growth because the state has experienced population decline for five consecutive years. The primary driver of the state’s population decline has been continuous outmigration, which the natural increase in population (births minus deaths) can no longer overcome. This problem isn’t being remedied either, as population loss is accelerating. As the Illinois population continues to age, recent migration trends will play an even bigger role in the state’s decline, meaning the situation is likely to get worse. Another major factor contributing to Illinois’ lackluster economic performance is the state’s weak labor market. Illinois suffered severe employment losses during the recession, and has struggled to regain jobs at the same rate as its peers. The temporary tax hike, state budget impasse and the eventual passage of the largest permanent income tax hike in state history have hindered job creation within the state. In addition, the continued outmigration of high-skilled workers from Illinois, which is evident in data from the U.S. Census Bureau’s Current Population Survey, has meant businesses that still create vacancies in Illinois are having a harder time finding suitable candidates in recent years. Fortunately for Illinois, the first years of the recession recovery held stronger jobs growth for the state. And although employment growth did not completely stall during the temporary tax hike period between 2011 and 2015, the uncertainty of the impasse and eventual permanent income tax hike essentially brought job creation to a standstill. That performance earned the state 38th place in terms of private sector jobs growth since the end of the Great Recession. If there is any silver lining when looking at the state’s employment situation, it is that despite a declining population of working-age individuals, the state has still been able to add jobs, albeit at a slower rate. 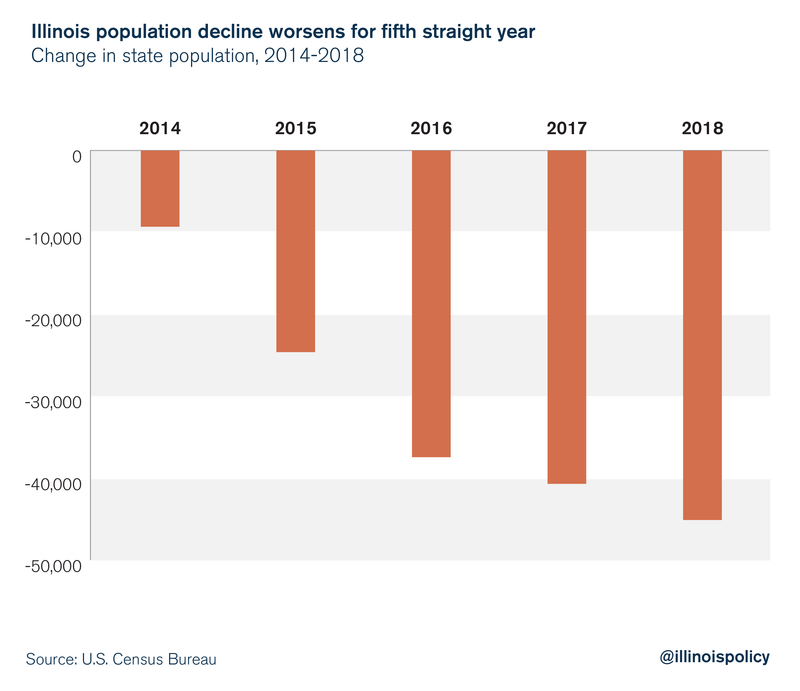 However, the persistent population decline of recent years is very likely to lead to even slower employment growth relative to the rest of the nation, further widening the gap between Illinois and other states. To continue adding jobs and to begin attracting people back to the state, Illinois needs to become more business-friendly. 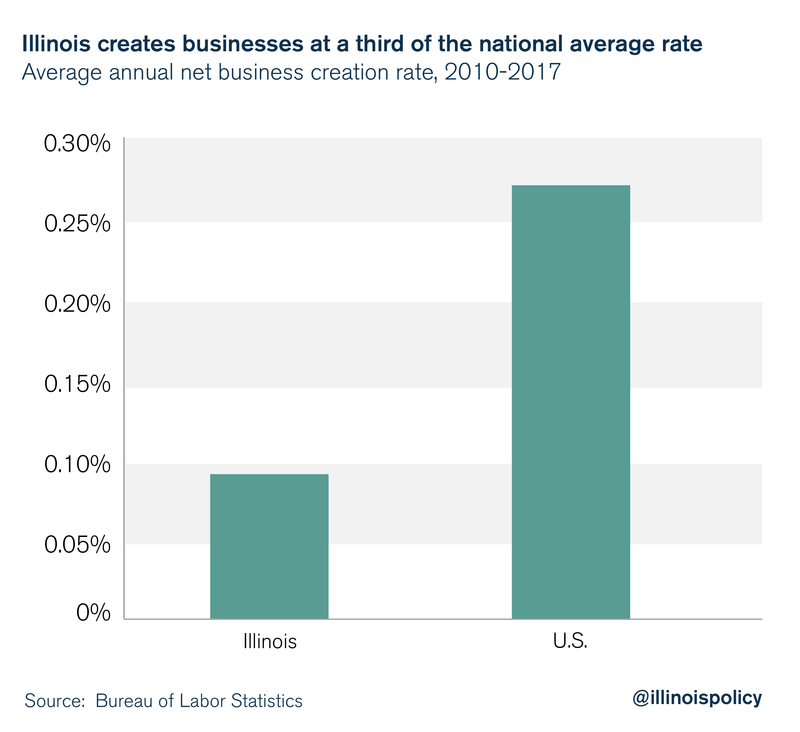 Illinois’ net business creation rate since the end of the recession is one-third of the rate nationwide. The third factor influencing Illinois’ economic growth is the growth in labor productivity, or growth in the contribution of each worker to the state’s economic output. Fortunately, Illinois is home to a relatively high-skilled workforce with a greater share of workers having attended college than the U.S. average, according to Current Population Survey data. A large increase in the percentage of high-skilled workers in the state’s workforce has historically meant above-average labor productivity growth for Illinois. Investments in human and physical capital boost labor productivity. Since the end of the recession, Illinois ranks 22nd in labor productivity growth. Unfortunately, though, many these individuals have been migrating out of the state according to data from the American Community Survey, and with a declining population and fewer new businesses, remaining companies and firms are less likely to invest in the development of new technologies and the purchase of capital goods necessary to improve labor productivity. 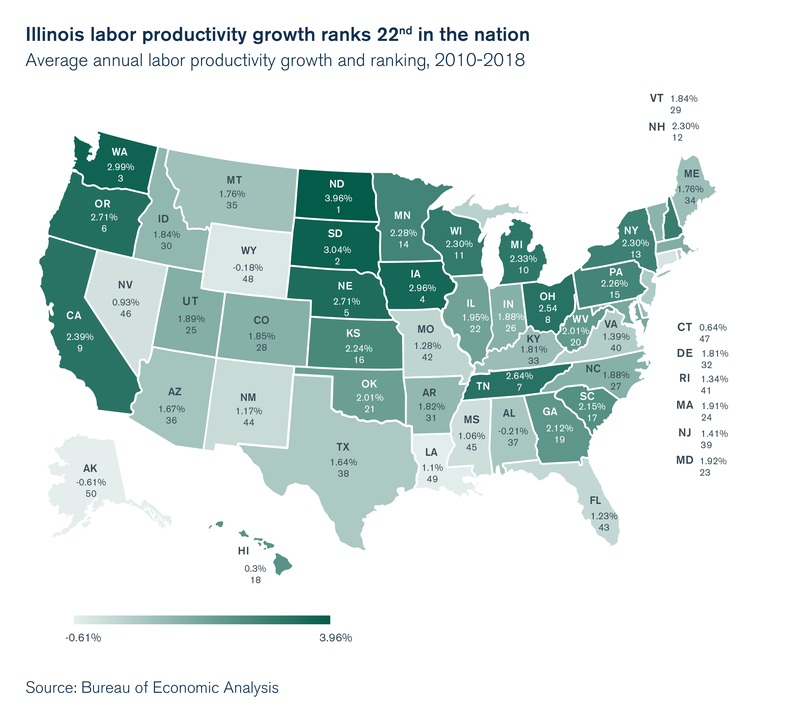 These factors have hindered Illinois’ labor productivity growth and may very well mean that the state slips in the rankings in the future. How did Illinois get to this point? 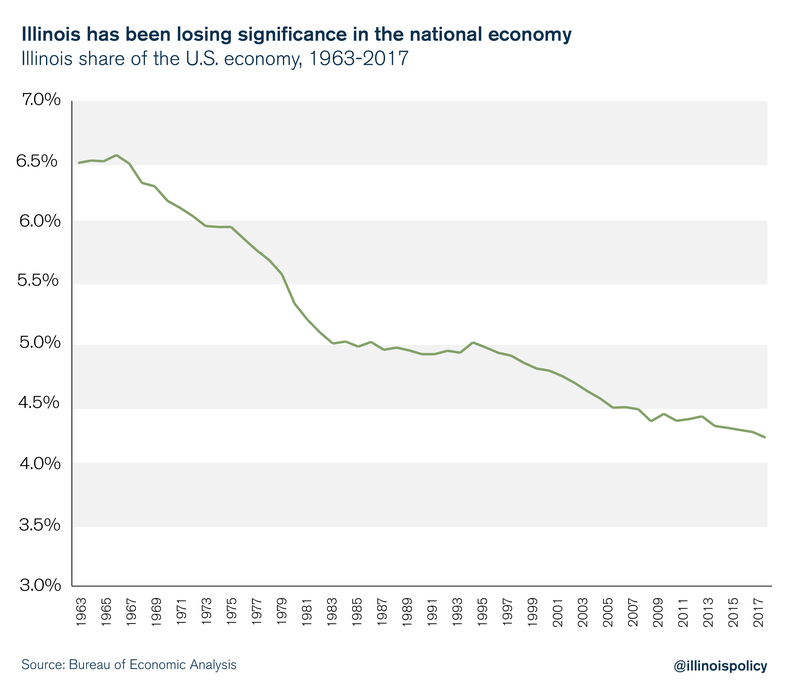 While many states are experiencing slower growth – in historic terms – than in the past, Illinois’ economy has seen an even worse decline relative to other states since the end of the recession. This decline has resulted from the state’s weak labor market and the outmigration crisis. However, it is important to understand the root cause of these problems: poor public policy. While other states have undertaken expansionary policies such as reducing the tax burden, Illinois has done the opposite – especially when it comes to the state income tax and local property tax burdens – hindering the state’s recovery. In the years since the recession, Illinois has taken a decidedly different approach to public policy than most other states. In the beginning of the recovery, and ever since, state and local governments have hiked taxes on Illinoisans while other states have tried to stimulate economic activity by lowering their tax burdens. In 2011 Illinois passed a temporary income tax hike that cost the state an estimated $56 billion in economic activity and 9,300 jobs through 2016. Although it was sold as a temporary tax hike, lawmakers essentially solidified the tax hike in 2017 when they passed the largest permanent income tax increase in state history just two years after the 2011 tax hike expired, raising income taxes by 32 percent on individuals and by 33 percent on corporations. The 2017 tax hike is likely to have similarly harmful effects on the state’s economy. 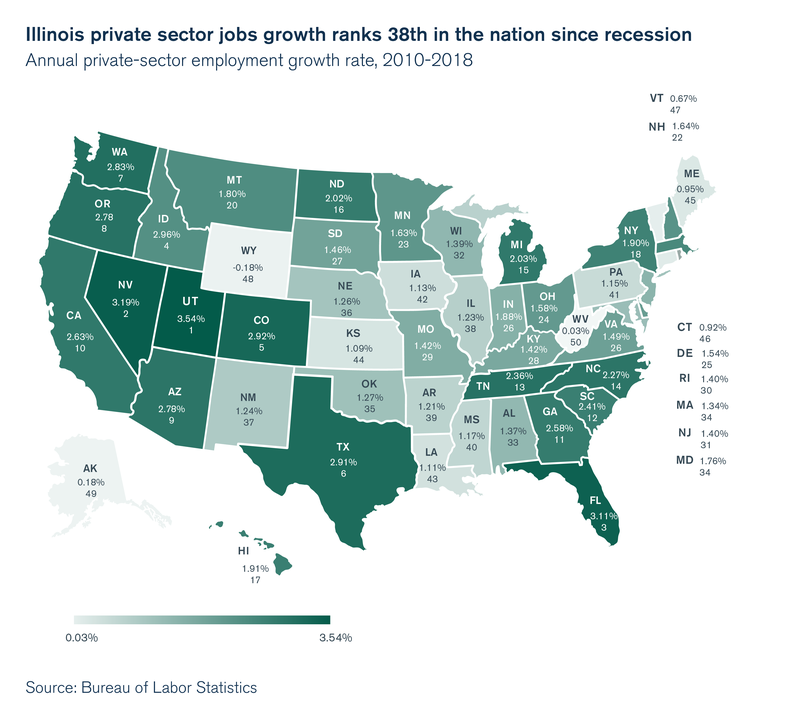 Preliminary data show Illinois’ private sector jobs growth fell to 44th in the nation from 27th since the 2017 tax hike. While it may still be too early to estimate the impact of the 2017 tax hike empirically, the employment slowdown is consistent with what experts would have predicted. Although tax hikes may initially cause tax revenues to increase, the negative economic effects of the 2017 tax hike will overshadow any benefits of additional revenue in the long run. Higher taxes discourage investment, which results in a decline in worker productivity. Slowing demand leads to lower employment growth and lower wages in the state. A weaker labor market encourages the tax base to leave, leading to an overall shrinking of the Illinois economy. Despite the huge economic cost, the tax hikes did nothing to address the structural state budget crisis: Illinois has not had a balanced budget since 2001 and is already facing a $2.8 billion budget shortfall in the coming year. Illinoisans are burdened with the second highest property taxes in the nation, according to recent studies. Over the past two decades, property taxes have risen 43 percent faster than home values statewide. And in some areas of the state, they have risen more than 200 percent faster than home values. Making matters worse, this sharp rise in property taxes hasn’t resulted in a similarly dramatic increase in public services. Instead, more than half of each new dollar is going toward employee pensions and benefits and debt service. The combination of rising income and property taxes without additional services that raise home values has made Illinois one of only three housing markets where homes have become a worse investment than prior to the housing bubble, meaning Illinoisans are now more likely than before to take a loss on their homes if they try to sell. This is just another reason prime working-age individuals, who are the most likely to purchase homes and start families, are leading the exodus out of Illinois. The unaffordability of the state and the weak labor market are the primary reasons Illinoisans are fleeing. In the rest of the U.S., personal income per capita grew 11 percent faster than Illinois from 2016 to 2017, according to the Bureau of Economic Analysis. In addition, Illinois job seekers face a much higher duration of unemployment than in other states, which explains why Illinois’ unemployment rate remains higher than the national average. Over the past decade, the state’s poor labor market conditions relative to other states have been responsible for 57 percent of all net migration, according to calculations based on IRS data. If Illinois’ labor market were as healthy as the national average, the state wouldn’t be experiencing persistent population decline. Slower economic growth ultimately leads to slower growth in tax revenues for state governments. This is particularly concerning for states like Illinois, which have massive unfunded pension and retiree health care liabilities. These costs are already hamstringing the state’s budget, crowding out spending on other areas such as social services and contributing to the state’s chronically unbalanced budgets. Prolonged deficit spending leads to debt accumulation, which impairs growth. This happens as expectations of a government debt crisis arise, along with concerns about large-scale future tax hikes. Consistent with Japan’s experience, new research suggests the fear of a public debt crisis lowers economic growth. Instead of taking on even more debt or reaching into taxpayer pockets once more, lawmakers need to enact the necessary reforms to rein in the state’s cost drivers and grow the economy. Continuing to kick the can down the road will only prolong Illinois’ budgetary and economic woes. A growing economy will stabilize government revenues, which Illinois’ state and local governments need to service debt obligations and avoid future tax hikes. Unfortunately, state revenues across the country – and particularly in Illinois – have become increasingly volatile since 2000 mostly due to reliance on capital gains taxes. Corporate income tax revenues are the most unpredictable and susceptible to change, followed by personal income tax revenues, with sales tax revenues being the most stable. Without fostering a growing and healthy economy, state and local governments will continue to struggle to pay for public services and ever-mounting pension debts. Unfortunately for Illinois, some politicians have called for scrapping the state’s constitutionally protected flat income tax in favor of a progressive income tax. Revenues from a progressive income tax are more volatile than revenues from a flat income tax because they rely on a smaller tax base that includes more income from investment, or capital gains, which is highly elastic. A stable tax environment will be essential for Illinois state budgets to cope with declining economic growth. Illinois state lawmakers have the opportunity to put the state on a path toward a more prosperous future through policy reform. But what kind of reform should a shrinking state pursue? One clear mistake, given the state’s people problem, would be scrapping Illinois’ constitutionally protected flat income tax. Progressive income tax states are hemorrhaging residents to more competitive tax environments, losing nearly 300,000 residents to other states over the past year as a group. Meanwhile, states with no income tax gained more than 300,000 residents. And taken together, flat income tax states, excluding Illinois, also gained residents from other states. Furthermore, income inequality has actually grown faster in progressive income tax states – likely due to other poor public policies, as the expert literature on the topic finds progressive income taxes to either have no effect or marginally reduce income inequality. Meanwhile, employment, economic growth, and government resources have grown slower than states without a progressive income tax. This is because progressive income taxes, relative to flat income taxes, discourage capital accumulation that results in higher incomes. For Illinois, transitioning from a flat tax system to a progressive income tax system would result in reduced output, reduced labor supply and a slight reduction in the long-run income gap between earning groups. Instead of looking to a progressive income tax for increased revenue, Pritzker and members of the General Assembly should look for reforms that address the state’s chief cost drivers. If Illinois is to reverse recent trends and foster population growth within the state, it must address the root causes of its migration problem: an unfriendly business environment that discourages investment and job creation, and punishes residents with high taxes. Instead of continuously hiking taxes, state lawmakers need to relieve Illinoisans of their enormous tax burden. A lower tax burden would stimulate investment and job creation, making the state a more attractive place for businesses and families to plant roots. The only way to get lower taxes – and more tax certainty – is to rein in government spending at the state and local levels. This means addressing the state’s pension obligations, which are one of the largest cost drivers of government spending and now eat up more than a quarter of the state budget. Despite paying billions of dollars a year into the state retirement systems, these funds are becoming less solvent over time, as returns on investment are frequently below their projected targets and 3 percent compounding benefit increases outpace inflation. Official estimates peg the debt at $133 billion, but less rosy analyses show taxpayers could be on the hook for as much as $250 billion. An amendment to the Illinois Constitution that protects already-earned benefits, but allows for a slower growth in accrual of future benefits – such as a true cost of living adjustment tied to inflation – would help to reduce the state’s pension debt. Once the largest cost drivers of state spending are addressed, the state can begin to focus on responsibly limiting the growth in government spending, giving confidence to families and businesses looking to invest in Illinois. A spending cap tied to economic growth could provide certainty about future government spending and help lawmakers avoid tax hikes to balance the budget. Illinois’ future does not have to include streams of residents moving out of state amid declining growth and opportunity. With the right taxpayer-friendly, pro­-growth economic and fiscal policies, lawmakers have the tools to build a better Illinois.